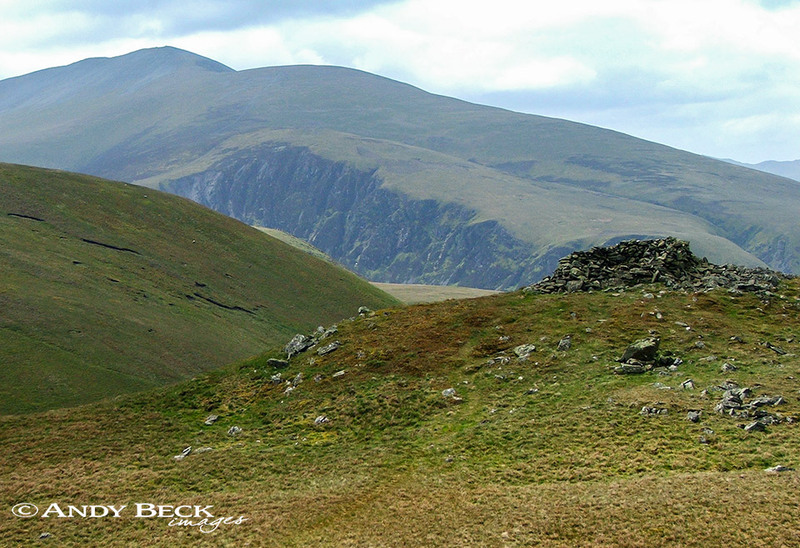 Summary: Meal Fell is a remote hill which lies to the north of the Skiddaw range in an area known as the Uldale Fells. 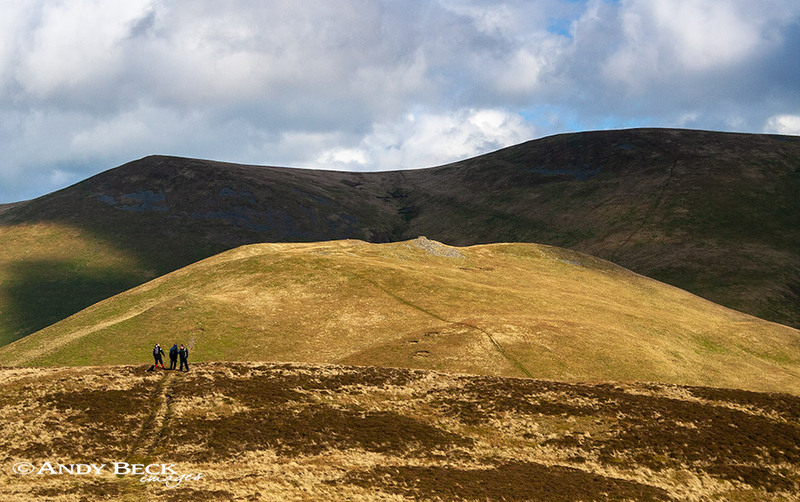 The fell features in it’s own chaper of book 5- The Northern Fells by Alfred Wainwright. However, it was not at first considered for inclusion in the guides as on his 1 inch maps, both Bartholomew and O.S. it was neither named or measured. Only on the old 6 inch maps which he used was the fell named. Wainwright estimated the height as 1770′. When writing this Pictorial Guide he realised that the book was a going to be lacking in chapters so he added hills such as Meal Fell to make up content. Like most of this area the terrain is made up of rough grass and some heather, occasionally there are outbreaks of rocks or scree such as at the summit of Meal Fell where rocks have been formed into a shelter. This has the look of an ancient tumulus but is not maked as such on maps. The north side of the fell is bounded by the River Ellen and to the south the boundary is made by Frozenfell Gill, both rivers flow to the sea in different directions. Views from the fell are either westward towards the sea or eastwards to the rounded slopes of nearby fells. Topographical details: Wainwright classed the summit as the stone shelter with an estimated height of 1770′ but it is at more like a height of 1780′ GR: NY 28258 33711. In reality the highest point of the fell is marked by a small cairn at 1804′ 550m which is 65m to the north-east of the shelter. The summit area has a curious almost circular rim surrounding a couple of small shallow tarns, the cairn of the highest point sits on this rim. It should be remembered that on his visits Wainwright could only estimate the highest point by eye but by using the stone shelter as his summit it gave him and those that followed his guides some feature to recognise as the top of the fell, an important factor in bad weather. Points of interest: The summit area with the hollow mentioned above is a curious geographical feature, another is Trusmadoor, to the south-west of the fell which is a natural gorge between Meal Fell and Great Cockup, the name is derived from the old word for gap. Tarns: small unnamed tarns at the summit- may be dry in summer. Adjoining fells: Great Sca Fell to the east, reached via a broad grassy slope. Great Cockup to the south-west reached via the depression at Trusmadoor. Nearest facilities: Car parking in roadside layby at Longlands to the north-west (free) limited spaces, or to the east very limited parking on the roadside just south of Orthwaite (free) but do not obstruct local traffic. Pub, The Snooty Fox offers food, drink and rooms and Mea’s Tearoom/gallery at Uldale. Star rating: (1.2 / 5) A low rating due to the lack of interest and views. The remoteness is a downside as well, quite a bit of effort to get there for little return. Back to The Lakeland 365 area map.